I've made ratatouille before, but this version - from Julie Child's "Mastering the Art of French Cooking" - is the best I've had. It was so flavorful! This ratatouille did take me a bit longer to make than anticipated, because I had forgotten that the eggplant and zucchini needed to be salted and set aside for about 30 minutes before sauteing. It took an additional 40 minutes to finish preparing dinner. You will need a skillet with a cover and a 2 1/2-quart pot with a cover. As for how to peel, seed, and juice a tomato, instructions may be found here. Separately toss the eggplant and zucchini in salt, place in bowls (or colanders), and set aside for about 30 minutes. Rinse the salt from the eggplant and zucchini and pat dry with a dish towel. Heat the olive oil in a skillet over medium heat. Saute the eggplant until browned on both sides, about 1 minute. Remove from the skillet and repeat with the zucchini. Remove the zucchini from the skillet. Cook the onions and peppers in the same skillet until the onions become soft, about 10 minutes. Stir in the garlic. Add salt and pepper, to taste. Slice the tomatoes into 3/8-inch strips and lay them on top of the onions. Cover the skillet and cook over low heat for about 5 minutes, or until the tomatoes start to release their juices. Uncover and baste the tomatoes with their juices. Continue cooking over medium-high heat for several more minutes until the juices have almost evaporated. 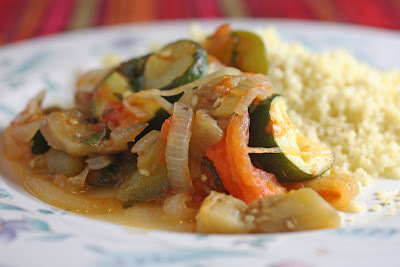 Divide the tomato-onion mixture into thirds and divide the eggplant and zucchini into halves. Place one-third of the tomato-onion mixture on the bottom of a 2 1/2 quart pot. Sprinkle 1 tablespoon of parsley over this layer. Layer half of the eggplant and zucchini on top of the tomato-onion mixture in the pot. Repeat this layering process with another one-third of the tomato-onion mixture and parsley and the remaining eggplant and zucchini. Finish with the remaining tomato-onion mixture and parsley. Cover the pot and simmer over low heat for about 10 minutes. Uncover and tip the pot to baste with the juices. Cook uncovered for another 15 minutes, basting several more times, until most of the juices have evaporated, and then its ready to be served.